Dr. Seuss book pictures are part of the reason why stories such as Horton Hears a Who have a treasured place in every child's library. Dr. Seuss is the pen name of Theodor Seuss Geisel, an American writer and cartoonist. He wrote and illustrated 44 books for children under the name Dr. Seuss, including classics such as How the Grinch Stole Christmas! and Green Eggs and Ham. He also wrote several additional books for children under the name Theo LeSieg. Even though he passed away in 1991, Theodor Seuss Geisel continues to be among the best selling children's book authors in the world. His books have appeared in 15 different languages and sold more than 200 million copies across the globe. They have inspired multiple children's television specials as well as Broadway musicals and full-length feature films. Read Across America, an event designed to promote a love of reading among elementary school students, is held in the United States on March 2. The event often uses Dr. Seuss artwork in its promotional materials since March 2 was Theodor Seuss Geisel's birthday. Theodor Seuss Geisel did not always want to become an artist. In fact, he was planning to attend Oxford and become a college professor when Helen Palmer, who later became his wife, encouraged him to turn his love of doodling into an entirely new career path. Before he turned to writing and illustrating children's books, Theodor Seuss Geisel created artwork for advertising campaigns and newspaper political cartoons. These early pictures were often watercolors or shaded pencil drawings. Once he began illustrating his famous stories, however, he switched to drawing with pen and ink and a limited palette of basic primary colors. Dr. Seuss's illustration style is known for moving the plot of a story forward with careful attention to action, color, and tension within a picture. Even though the technology for color printing was severely limited at the time, he was very thorough in selecting the best colors for each story. For example, the vibrant reds and blues featured in The Cat in the Hat were selected because he felt this combination would be most engaging for the target audience of children ages 4-8. 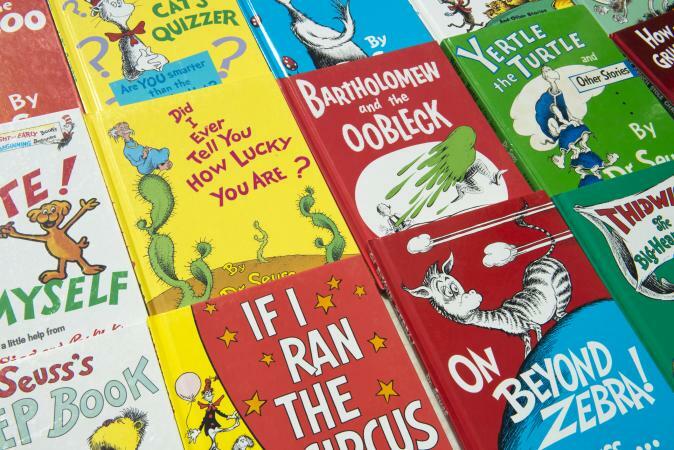 Since they feature a simple vocabulary and themes that are appealing to most children, Dr. Seuss books are commonly used in elementary school lessons. Their place is not limited to just the English classroom, however. Seussland has toys, stationery, and gifts that incorporate various Dr. Seuss book pictures. You can even purchase Dr. Seuss apparel for the book lovers in your life. Pottery Barn Kids sells bedding, artwork, and various home accessories for people who want to create a Dr. Seuss themed nursery or child's room. Dr. Seuss Art lets you purchase fine art prints from your favorite Dr. Seuss books. You can also find several Web sites with ideas on hosting Dr. Seuss themed parties for birthdays and other special occasions.